Sterling Publishing (NY), 9781454936022, 176pp. Going keto is now easier than ever, with this highly effective 28-day eating plan that guides newcomers every step of the way. Burn fat, not carbs This ketogenic-eating plan for weight loss helps you switch to a low-carb, high-fat, moderate protein diet so your body will use fat--not glucose--for energy. It features 85 delicious recipes that encourage rapid and sustained weight loss with ease. Plus, each day includes four filling meals--breakfast, lunch, dinner, and a snack--designed to help your body adapt to the new plan without feeling hungry or lethargic. 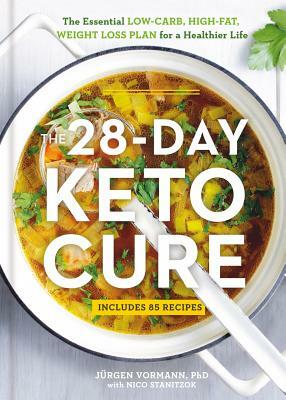 With a comprehensive introduction explaining the science behind the popular diet, this is the perfect plan for beginners looking to get healthy on keto. Recipes include Almond Pancakes with Sour Cherry Compote, Avocado Smoothie with Cardamom, Oven-Baked Omelet with Creamed Mushrooms, Curry Soup with Shrimp Skewers, Souvlaki Kebabs with Marinated Feta, Moussakka, Chicken Legs in Bacon Sauce with Savoy Cabbage, Chocolate Coconut Balls, Peanut Bars and more. Professor Jürgen Vormann studied Science of Nutrition at the University of Hohenheim, Stuttgart, Germany, where he also earned his doctorate in Pharmacology and Toxicology of Nutrition. He is head and founder of the Institute for Prevention and Nutrition (IPEV) in Ismaning near Munich, Germany. He has written two nutritional books and is on the advisory board of various nutrition organizations. Nico Stanitzok is a chef with a dietary background, a well-known food blogger, and successful author of several cookbooks.